Ok, it won’t just be a throwing facility. The field house will also contain a state-of-the-art, 200-meter, banked, hydraulic track surrounded by a three-lane, 300-meter practice track, a weight room with 42 platforms, training facilities for the rowing, soccer, tennis, wrestling, lacrosse, and gymnastics teams, and enough locker room space for a good chunk of the civilized world. But, the fact that you are reading this article on this site tells me that you are not terribly interested in banked tracks or gymnastics facilities, so let’s get to the good stuff. He also accumulated quite a bit of expertise in the construction of track and field facilities, so when the athletic department acquired two old warehouses on the edge of campus and decided that the land they occupied would be an ideal spot on which to build new indoor and outdoor track arenas, Jerry was the perfect guy to have on hand. Fortunately, the administration at Michigan realized that and gave Jerry lots of leeway in designing the new facility. Those of you who have been involved in the construction of a track venue know that this is a rare and wondrous occurrence. When my school rebuilt our athletic facilities a few years ago, our principal called me into his office and demanded to know why we had to have a concrete pad from which to throw the discus. “Can’t they just spin around on the grass?” he fumed. We got our concrete, but I always felt like he resented it as an unnecessary expense. Jerry’s experience at Michigan has been just the opposite. Jerry is one of those guys who could probably coach any event in track and field, so he was able to pitch in with advice on everything from the layout of the track to the ideal seating capacity (2,000 permanent seats, which can be expanded to 3,500 if he gets his wish to someday host the Big Ten and NCAA championships). But his area of expertise is the throws, and three decades of coaching world class shot putters and discus throwers such as Mike Lehmann, Gabor Mate, Edis Elkasevic, and Cory Martin gave him a chance to visit a great variety of training and competition venues across the United States and Europe. Jerry also encouraged his athletes to send him pictures of the facilities they came across on their travels overseas. Given the opportunity to design the new facility at Michigan, he tried to combine the best features of all these places, some as close as Lincoln, Nebraska, others as far afield as Berlin, Germany. A top priority was creating a space that would allow for year-round training of the long throws. One trick to constructing an effective indoor training space is to find the right material in which to throw the hammer. It has to be flexible enough so that the implement does not rebound back at the thrower, but sturdy enough to withstand a lot of abuse. Luckily, Jerry’s former putter Eric Werskey spent a lot of time in Germany over the past couple of years and was able to obtain the exact specs for the materials the Germans use in their indoor throwing facilities. According to Jerry, “they throw the hammer into strips of PVC vinyl, one quarter inch thick (see photo below). 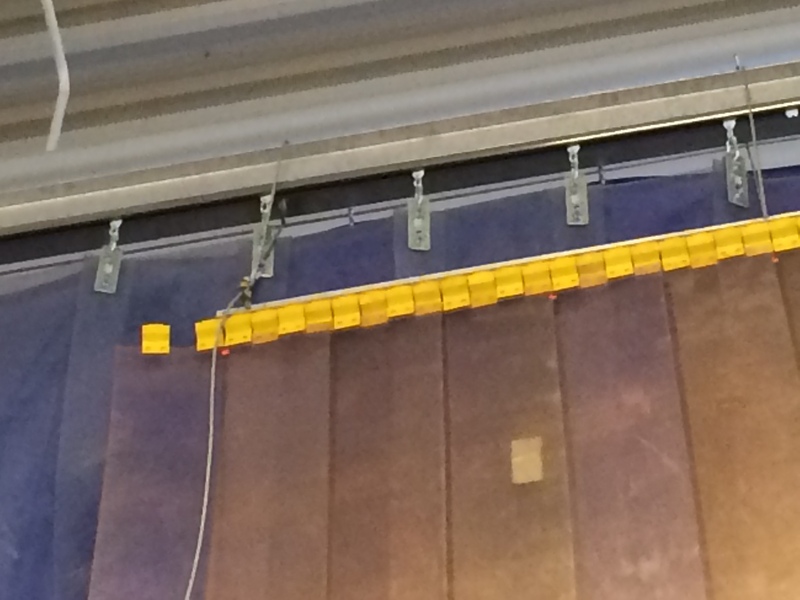 You hang the strips so that they overlap and you can throw a hammer into it and it will only deflect maybe a foot and a half.” The Michigan space will use that exact grade of PVC. Notice how misty/rainy/crappy the weather looks outside. Kind of like a typical day in the Midwest between November and March. But with a setup like this, who cares? Your athletes can throw from a dry, covered ring and still know how far their attempts are traveling, which is a distinct advantage over throwing into a net. What makes the Michigan facility potentially better than the German training centers will be the ability to throw the javelin from indoors to out as well. 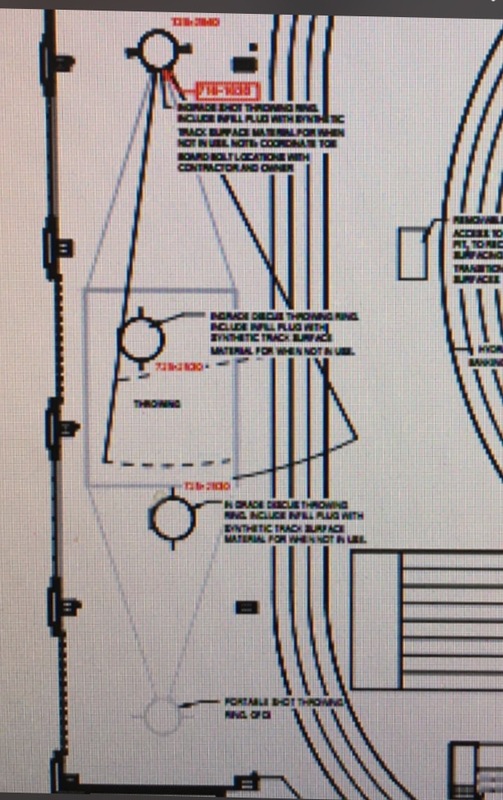 Notice on those blueprints that an extended straightaway from the practice track ends just short of the throwing rings. Jav throwers will be able to use that section of the track as a runway while launching the spear out onto the grass. 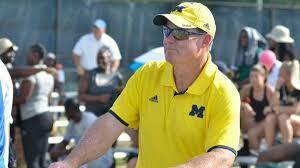 One more aspect of the Michigan facility bears mention, though it does not pertain strictly to the throws. As much as I love the sport of track and field, I think I can speak for most coaches, athletes and fans when I say that sometimes meets, especially indoor meets, can drag on a bit too long, A lot too long when you have a field of elite pole vaulters. Jerry has sought to remedy that situation by setting up his new facility so that not only can the weight, shot, and high jump be run concurrently, but so can two long jump and two (Thank you, Jesus!) pole vault runways. 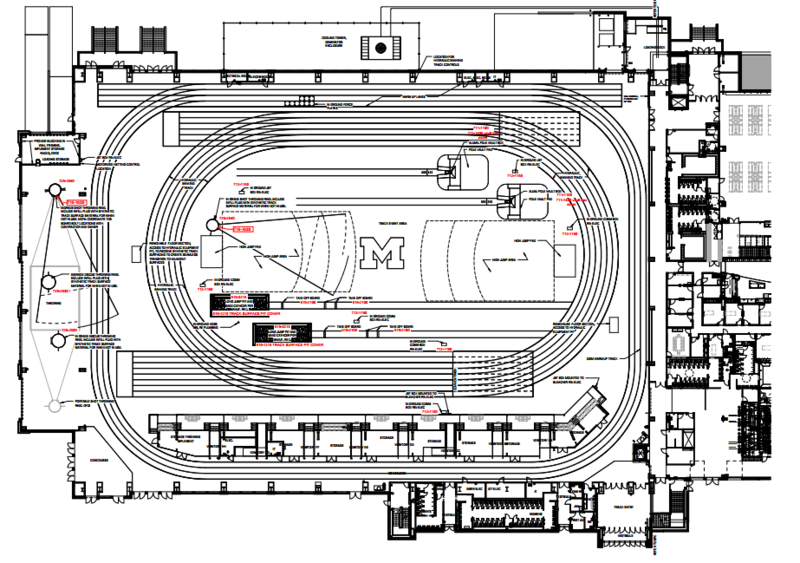 The facility is set to open in January, 2018, with a quad featuring Michigan, Notre Dame, Ohio State and Michigan State. Jerry predicts that meet can be completed in two hours. He is also trying to put together a Big 10 v. ACC challenge featuring at least nine teams, which he believes will take no more than five hours, start to finish. And speaking of making track and field more fan-friendly, Jerry also designed the new facility to allow live streaming of practices and competitions. Whatever they end up calling this new athletic complex, kudos to Jerry for envisioning a cutting-edge venue that will provide a great track and field experience for coaches, athletes, and spectators. And kudos to the Michigan administration for hiring a coach with vast experience in his sport and then trusting his advice. Maybe they should call it the Palace of Miracles. As a Michigan fan I may have to make a trip up to see this place. This is what midwest track and field needs, especially throws. There are some nice facilities but none that seem to be of the caliber of this one. Maybe this will be the push that some other schools need to further there track and field facilities. Thanks for the article and heads up Dan. “The parents will be able to sit at home and watch. That’s the direction that track needs to go. We need to get it out to more alumni, fans and parents. ” The challenge will be to get the decision makers at the B1G Network to make space for T&F programming. Pac-12 Network is slow to do that. I hope you fare better, or can get UMich to sponsor the programming through B1G. Michigan hosted the first seventeen or so editions of the NCAA Indoor Championships (all in Detroit at Cobo Arena, Joe Louis Arean, or the Silverdome) thanks to major effort by then-AD Don Canham. It would be tremendous if the meet came back to Michigan. This looks like it will be the best indoor facility in the world, and if they could figure out a way to fit 7,000 spectators in there then I’m sure the IAAF would be eager for its World Indoor Championships to be there.